Seems to me the conditions are about right for a Star Trek/Star Wars crossover comic. Marvel is making a splash with their newly regained Star Wars license; IDW has demonstrated Star Trek's crossover viability with Legion of Super-Heroes, Doctor Who, and Planet of the Apes, at least. And c'mon, haven't you always wanted to see the Enterprise versus the Death Star? Captain Kirk wooing Princess Leia? Spock using the Force? Sulu with a lightsaber? Not to mention the inevitable sequel that introduces Data to R2-D2 and C-3PO. These scenarios assume one main thing, which is that if you're going to do a notable crossover between Star Trek and some other entity, it's probably best to use The Original Series or Next Generation. I am personally perhaps a greater aficionado of Deep Space Nine and Voyager, but even I recognize that when it comes to big Star Trek franchise moments, probably better to bring the best-known, most-recognized characters. Which brings us to Star Trek Vol. 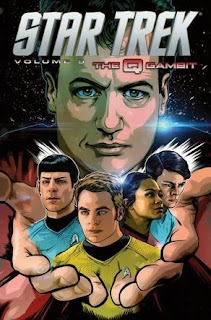 9: The Q Gambit, the latest collection of the ongoing Abramsverse Star Trek comic, written as always by Mike Johnson and with participation by writer-producer Robert Orci. As the title promises, the book does introduce the nuTrek crew to Q, and it is indeed the Next Generation Q and not some sort of nuQ Q. But, for what's essentially the first-ever old Trek/new Trek crossover, it's rather surprising where this book doesn't go. Again, as a fan of the supplementary Treks, I enjoyed this book, and if it got gimmicky at points, the story through-way was clever, especially the end. For the more casual or iconic Trek fan, however -- the one who might pick up this book precisely because of the old/new crossover and not because they enjoy Trek's deeper cuts -- I imagine the choice made for this book might seem a strange one. It's ironic and a bit melancholy to pick up The Q Gambit just after the death of iconic actor Leonard Nimoy. Not to confuse the man with the character, but the book starts -- surprisingly but welcome -- from the perspective of (the prime-Trek) Jean-Luc Picard, mourning Spock's apparent death, until Q arrives to announce Spock's survival in the other universe. It's an unintended but heartening note, this idea that though the man is gone, his legacy might live on elsewhere. In bookending the story with Picard's grief and then hopefulness, Johnson offers the story a theme of "gone, but not forgotten," also not in the least because of the other characters who appear here. Those characters are, in total, the entire credited cast of the fourth season of Star Trek: Deep Space Nine (the original cast plus Worf). From my point of view, I am not at all opposed to the Deep Space Nine characters getting extra spotlight and meeting the Abramsverse Kirk and company; I'm rather surprised and delighted by it (in the powers-that-be of the Abramsverse Trek eschewing the Star Trek prose program, one imagines some distain for the larger Trek universe; obviously utilizing Deep Space Nine in this way puts some lie to that). But at the same time, again, the purist in me can't help but feel a missed opportunity in the Abramsverse Trek's first crossover being with Deep Space Nine, instead of some Abramsverse Next Generation analogue or with the Original Series crew. Frankly, Picard's presence at the beginning and end of the book helps immensely because it offers at least some Next Generation tie (though I'm no fan of the comics continuity where Picard has left the Enterprise, vs. the novels), and at least we can say accurately now that Picard has appeared in a nuTrek comic. I don't turn away Prophets and Pah-Wraiths lightly, but I'm not convinced this was the place for them. Using Benjamin Sisko as the rebel leader made perfect sense here, as did positioning Kira on the Bajoran side, Odo as their secret weapon, and Dukat running the Cardassian facet of the Dominion. Ditto Worf is a nice touch as the Klingon commander (though Johnson missteps in having nuTrek Kirk opine on the difference between his Klingons and the future ones, when the difference is only in Original Series, not nuTrek). I also thought Johnson made a neat choice letting Keiko O'Brien command the Defiant. But then in a Wizard of Oz-type procession, the nuTrek characters also have to meet Dr. Bashir and Quark, and then far too late in the book Jake Sisko and Jadzia Dax cameo for about a page. Had Johnson pulled from across the Trek universe, these cameos might have maintained their novelty throughout, but as it was, by the middle of the book the cameo schema becomes predictable. If anything, Q Gambit is a more a feather in the Deep Space Nine group's cap than the nuTrek crew. The Enterprise-D crew got to spend significant quality time with alumni of the original Enterprise, but Sisko and company only saw Kirk in passing in "Trials and Tribble-ations." Here, for instance, we have a charming Miles O'Brien/Montgomery Scott encounter, of the sort reminiscent of when Scott and Geordi La Force palled around in "Relics." The book's central conflict, also, is all Deep Space Nine -- Dukat, possessed by a Pah-Wraith, threatens to lead the Dominion to victory. Also -- and I can't believe no Trek prose author ever came up with this before -- the Pah-Wraiths' victory threatens the Q Continuum, necessitating Q get Kirk and company involved. There's an exciting moment where Spock himself is possessed by one of the Bajoran Prophets, though I might rather have seen Spock with Q's powers and/or some acknowledgment in the story of Nimoy and John de Lancie's audio drama at the point in which Q meets nuTrek Spock, but no dice on either count. That aside, there's no reason for the nuTrek crew to be in the book, really; Johnson offers a fairly faithful alternate history Deep Space Nine story with no overwhelming nuTrek elements, and the reality-lost crew could as easily have been Deep Space Nine's own as it could have any others. Maybe the only thing that sells this as a Abramsverse Star Trek story is that in the wake of Star Trek Into Darkness (filtered through the lens of Star Trek II: Wrath of Khan), Q purportedly brings Kirk into the future to prove to him the existence of a "no-win scenario." Verily Kirk's character arc in Wrath of Khan is that he's never believed in the no-win scenario, but Spock's death in the end reveals to Kirk his own hubris in that vein (I just read a great article about this and how Star Trek III: Search for Spock robs Kirk of that character turn, and now I can't find it. Anyone? ); this is lessened, in one of the many ways that Star Trek Into Darkness is lesser, in that Kirk never quite loses (in that he sacrifices himself) and is resurrected anyway in the span of one movie. To that end, Johnson actually offers to redeem Into Darkness's thematic shortfall, though he doesn't follow through in the end -- what Kirk learns is not that there are no-win scenarios, but rather he's reinforced in his belief that nothing's "no-win" as long as his Enterprise crew is with him. Artist Tony Shasteen has the unenviable job of drawing characters portrayed by actors from three separate television shows/movies, but he accomplishes it well; everyone is recognizable (and Johnson largely gets the voices, too, though sometimes I think his Sisko spoke at too much length). An interesting aspect of the art, however, is that Shasteen preserves the detail-heavy, flashing-lights-and-stark-white aesthetic of the nuTrek Enterprise, but then additionally also the mostly dark, smooth, and uninterrupted walls of Terok Nor nee Deep Space Nine. Whereas the interior of the Original Series Enterprise looks small and quaint beside the later Trek ships, in Q Gambit it's quite the opposite. Dukat appears visually to get an upgrade when he arrives on the bridge of the Enterprise, which is an anachronistic result of the nuTrek Enterprise being "newer," in reality, than Deep Space Nine. (See also: what does a Pah-Wraith need with a starship?). Inasmuch as I've picked apart Star Trek Vol. 9: The Q Gambit, let me reiterate once again: Oh my god, the nuTrek crew meets a Prime Trek crew? And it's Deep Space Nine?! The DS9 fan in me will forever wear this with pride. Mike Johnson does quite a fine job with a story that's faithful to all the characters involved, and Picard's appearance is surely a nice touch. Even given all of that, this is probably not what I would have chosen for the first Trek/Trek crossover, and the story only barely rises above the level of a string of pretty cool cameos -- but they are pretty cool cameos, and heck yeah to Deep Space Nine for getting there first. Don't sit here and give me inevitably amazing crossover ideas that I can't have. As much as I'd enjoy a Trek/Wars comic, it would require Disney and Paramount to work together and I just don't see that kind of cooperation happening for a comparatively small project. Look how long it took just to get Trek/Doctor Who published. The easier, and potentially crazier, concept for a crossover is with another major IDW property. You just need five simple words to set it up: "The Enterprise arrives at Cybertron..."
Klingons riding Decepticons! A transforming Enterprise! My brain is exploding! Glad to hear from another DS9 geek. That's in fact the best reason to care about this. Oh, and Q! I've been thinking about a DS9 re-watch these days if I had the time. I might just have to tide myself over with a "Way of the Warrior" viewing.